Tough Win asserted his authority over Korean racing with hard-fought but eventually emphatic win in the Busan Metropolitan City Mayor’s Stakes this afternoon. 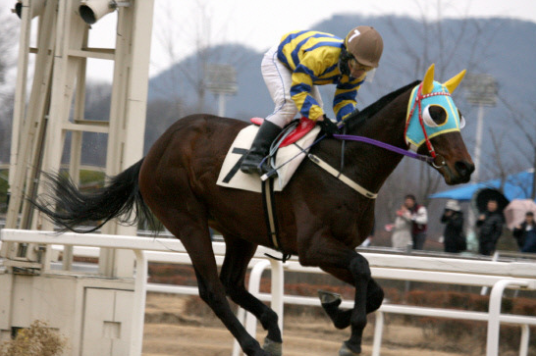 The 2010 winner started 2/1 favourite and was always well positioned before getting the better of young up and comer Beolmaui Kkum and defending champion Dangdae Bulpae in the home straight. Only the absent Jiguem I Sungan currently has any claims on him at Seoul and he dispatched Busan’s finest with ease today. Running 2nd, Beolmaui Kkum showed that he has talent and can stay a reasonable distance too. He will be one to watch for the rest of the season. As for Dangdae Bulpae, there were many doubts as to the fitness of the defending champion, who came into the race off a 6-month lay-off. While he couldn’t beat Tough Win, a 3rd place finish is extremely creditable and suggests we haven’t seen the last of the 3-time President’s Cup winner. A disappointment was Gamdounguibada. The filly was the one who relived Tough Win of his Grand Prix Stakes title at Seoul last December and she was well-backed to repeat the feat here. Instead of challenging Tough Win, however, she finished 11th which makes for 2 poor runs in a row. Now 6 years old, Tough Win recorded his 22nd career victory and is unbeaten in all 4 starts this year. The Busan Metropolitan is often referred to as the “Summer Grand Prix”. After today, by the time the real “Grand Prix” comes around in December, Tough Win will most likely be favourite to regain that title as well. A full-field of 16, including 2 previous winners, will line up for the Busan Metropolitan City Mayor’s Stakes at Busan this Sunday. The race is sometimes known as the “summer Grand Prix” bringing as it does, the best horses from both Seoul and Busan together in a way that only the season-ending Grand Prix Stakes usually does. This year, though, Seoul disappoints. Granted, they may well have the winner in the shape of 2010 victor Tough Win but apart from him, all the leading contenders are from the host track. Last year’s champion Dangdae Bulpae returns after a 5 month lay-off while Grand Prix winner Gamdonguibada also takes her chance. Hasn’t really made the grade at Class 1 and is without a win in 2 years. Won’t change here. Very solid horse who was 2nd to Beolmaui Kkum and ahead of Gamdonguibada in the Gukje Sinmun Cup last start. Knows where the winning line is and could cause problems. Worth looking at if he seems neglected in the betting market. Big taent who has only been out of the money once. A rather disappointing 4th last time out behind weaker rivals than he’ll face here and is without a win in three. Will have backers though. Was injured for 6 months after this race last year. He won his return and has hit the money on his 4 subsequent starts. It is hard to recommend him at 2000 metres though. Was in cracking form at the tail-end of 2012 but has struggled to repeat this year. A place is not beyond him but a win seems unlikely. The Boss. He won this race as a 3-year old in 2010 but disappointed in 2011 and 2012. Lost his Grand Prix title last December but has three easy wins behind him this year. He will top many people’s tickets. You’d think 26 year veteran trainer Ji Yong Cheol would have better things to do on a Sunday afternoon than take Murangae to Busan. His only win was only three starts ago but while he seems a late-developer who runs very consistently, he gets consistently beaten and that won’t change here. One of 2 entries in the race by Aussie trainer Peter Wolsley. He has 2 wins from 3 starts to his name at class 1 (including one behind stablemate Ghost Whisper). He is second-string here but Wolsley doesn’t enter his horses where they can’t challenge for money. Foinavon in the Grand National, Mine That Bird in the Kentucky Derby. Those 2 would be nothing compared with Blueband Mama winning this race. A well-beaten 2nd behind Ghost Whisper last time but has plenty of talent. Probably 3 or 4 will be too quick for him here. A 3-time President’s Cup winner, holder of the record for most Stakes races won in Korea, arguably the best horse Korea has ever produced and the defending champion. The problem is that he hasn’t run since February due to injury and was touch and go to make it to the start line here. Comfortably won his race trial earlier this month. If he is in form though, at 2000 metres, he is very difficult to beat. Champion racehorse of 2012 by virtue of winning the Grand Prix Stakes at Seoul last December, she started this year a pair of routine victories before turning in an out of sorts 3rd behind Beolmaui Kkum last time out. You can’t be out of sorts in this kind of company and if she runs to her best, she has every chance. Forget Foinavon and Mine That Bird, we’re into Buster Douglas over Mike Tyson territory if Hwanggeumjijon wins this. His jockey, Kim Gui Bae, has been riding for 34 years. In that time he has ridden just 299 winners. This will not be number 300. 2nd behind Wild Myeongun on his class 1 debut last time out after 2 smart wins at class 2. Is an improving type but looks a little outclassed here. The wildcard. Full brother to Seoul-based Stakes winning filly Kkakjaengi, he beat three of his rivals here to win the Gukje Sinmun Cup last start with Gamdonguibada among those defeated. That was his frist try at class 1 and, while he’s never gone 2000 metres, there’s no reason to think he won’t get it. A potential star. Collapsed with heat exhaustion after this race last year and was given the rest of the year off. In wonderful form at the moment though winning his last 3 outings. Must be given respect and if things go his way, under Darryll Holland, he has the ability to pull off what would be the biggest win of trainer Peter Wolsley’s career. Fly Top Queen, the most expensive racehorse ever imported into Korea, made her second racecourse appearance and coasted to her second easy win at Seoul Race Park this afternoon. The 3-year old filly was sent of the long odds-on favourite for the class 4 race over 6 furlongs and jockey Park Tae Jong never moved as he guided Fly Top Queen to a 6-length triumph. Fly Top Queen [Henny Hughes – Cape Discovery (Cape Town)] was imported to Korea last year after being bought for $225,000 at Ocala. Suffering setback after setback she finally made it to the racecourse a month ago. So far, she’s been worth the wait. 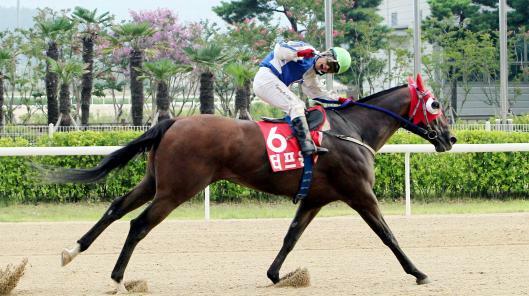 Almost a year after being diagnosed with tendinitis, Smarty Moonhak, the phenom who took Korean racing by storm as a 2-year old in 2011, has quietly been returned to Seoul Race Park to resume training after his treatment was deemed a success. Smarty Moonhak [Smarty Jones – Madeira M’Dear (Black Tie Affair)], a bargain $14,000 purchase at the 2010 Keeneland September Yearling sale, was beaten on his debut but went on to record 4 straight crushing victories against older opposition culminating in a 10-length win in the Turkey Jockey Club Trophy in November 2011. This earned him an unexpected nomination to the season ending 2300 metre Grand Prix Stakes – the first 2-year old ever to receive one – in which he ran 3rd behind Tough Win and Mister Park. 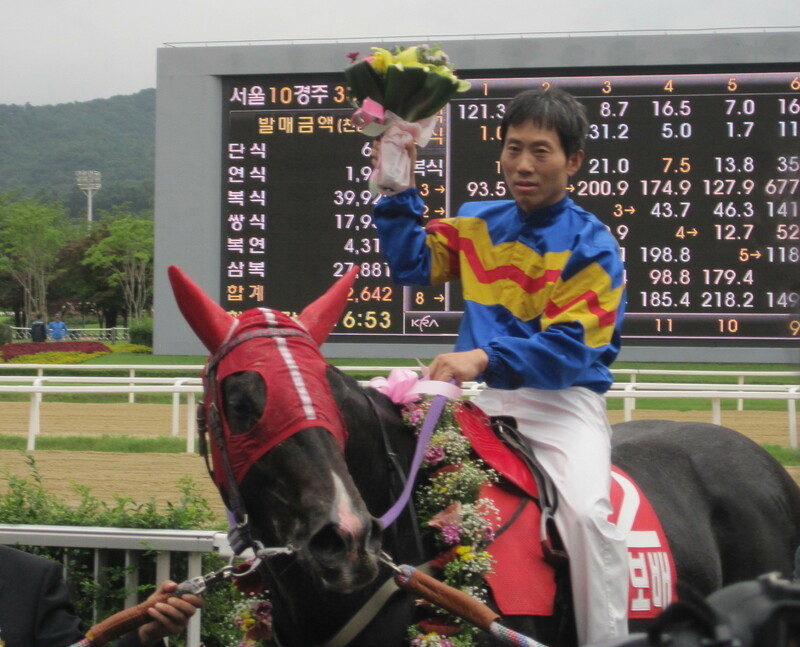 He started his 3-year old season in imperious form winning four class 1 races with his by now customary ease before travelling to Busan for the “Summer Grand Prix”, the Busan Metropolitan City Mayor’s Stakes. On a sweltering night on the south coast and sent off the odds-on favourite, Smarty Moonhak found himself beaten by Dangdae Bulpae, a horse who by that time was already winner of more Stakes races than any other in Korea. While a slight disappointment, it was no disgrace. However, a week after the race it was confirmed that tendinitis had been detected. Coming just weeks after the tragic death of his Grand Prix rival Mister Park, it was a heavy blow for racing. Between spells of treatment, Smarty Moonhak recuperated at Taepyeong Farm, the same place he had stayed when first imported to Korea. 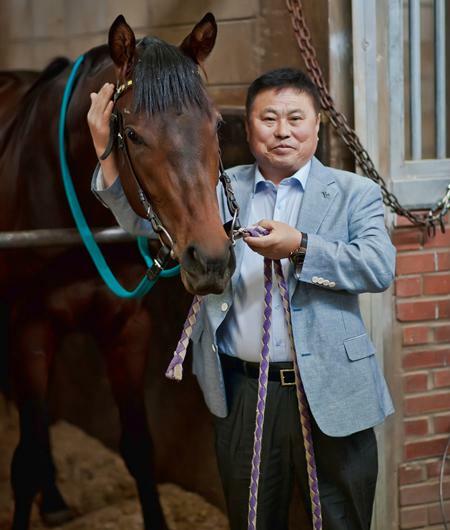 He returned to Seoul Race Park on July 4 and is now in the care of trainer Park Hui Cheol, his previous handler Ko Ok Bong having retired during his absence. Reaction to his return has been mixed. There is happiness that the treatment has been successful but also a certain amount of acknowledgement that past experience tells us that Smarty Moonhak may not be the same horse he was before. There have been instances of horses returning after long lay-offs. Baekgwang (The Groom Is Red) had 2 year-long absences, receiving a similar kind of stem-cell treatment during the second one. He returned – and won a class 1 race – but was retired shortly after. Then there have been those who have returned to the track but never made it to racing. 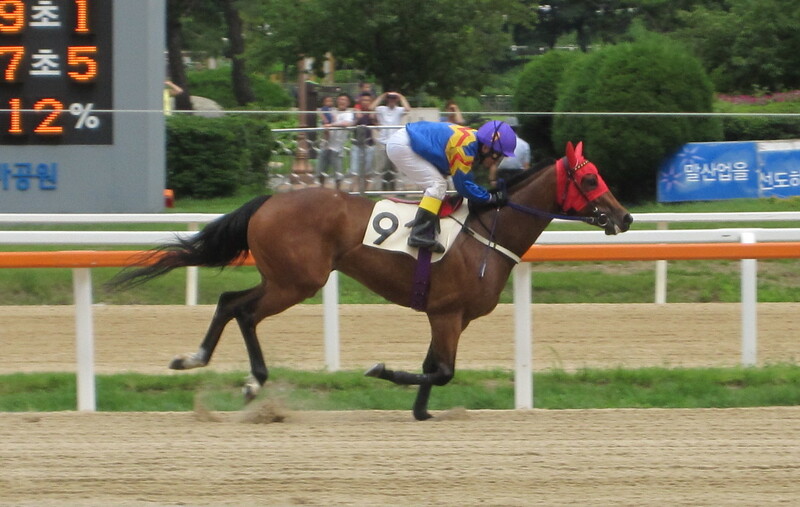 J.S Hold (Ft. Stockton) was injured as he won the final leg of the 2007 Korean Triple Crown. He returned to training nearly a year later but never made it onto the course. While he has been seen on the track in the mornings, Smarty Moonhak is yet to put in a timed-work. His next step is to be entered for a race-trial so he can re-qualify to race. Then and only then can he be entered for real. Connections have assured racing fans that they wouldn’t have brought him back if it wasn’t safe to do so and he will be returned to Taepyeong to begin his Stud career if anything changes. He won’t race unless they are convinced he will do himself justice. Welcome back, Smarty Moonhak. Be safe. Gwanggyo Bisang, a 3-year-old gelding, cruised to victory in the Munhwa Ilbo Cup at Seoul Race Park today. Geldings are ineligible for the 3-year-old Classics. If they were, Gwanggyo Bisang (Menifee) would surely have been a leading contender. He came into the race today with 5 wins from 6 starts at a variety of distances and, after sitting towards the back of the field during th early stages, he made short work of passing the whole lot to win by just under 3 lengths. K Tap (Menifee), a Derby also-ran was 2nd with the promising Heukgisa (A.P.Dancer) in 3rd. It won’t be long until we see Gwanggyo Bisang in class 1 action and his is a name to look out for later in the year. While it was a first visit to the Stakes winner’s circle for Gwanggyo Bisang, for his jockey it was anything but. 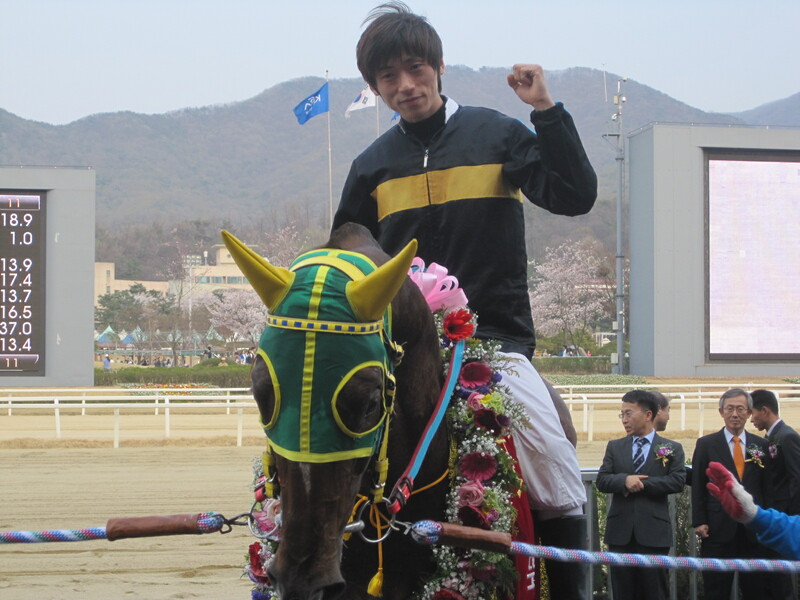 Park Tae Jong has won more races than any other rider in Korean history – he’s closing in on 2,000 – and is one of only 3 jockeys still riding who first qualified for their license at the old Ttukseom Racecourse. The 47-year-old Park’s first Stakes win came in the now discontinued Mugunghwa Cup in 1992 and with the exception of the Oaks, has won every big race in Korea. He may win a few more on Gwanggyo Bisang. * Next week sees the start of what is perhaps the highlight of the Korean racing year – four weeks of evening racing. During that time, the first race at Seoul will be around 2pm with the last around 9pm.